I’ve had a few traumatic experiences in life: the car door suddenly flying open while your mom is driving (the lock on the door was faulty), horror movies (my dad was an avid Freddie Crouger watcher), and wincing as I saw pictures of my Grandfather’s proud kills during hunting season. Apparently I used to wince when being near a lobster tank when I was little. Once my dad brought home lobster and as I crawled across the floor so did the lobster. When I said I wanted to get some crabs, I didn’t think that statement through. I felt really guilty pulling them apart. I was remembering how Michael Pollan wrote about killing, seeing the picture of him next to his kill, and then cooking the kill. I was thinking about how man really does have that instinct within, all logic, emotions, and knowledge aside. 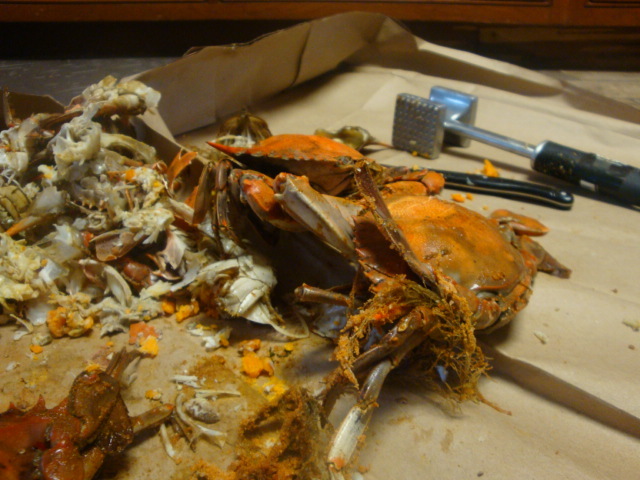 Needless to say, I won’t relive the pulling apart crabs experience. I’ll be honest in saying that I rather enjoy the occasional crab cake without thinking about how it got to my plate. I don’t eat crap – but I’d imagine it would be a difficult process to pull it apart. Though they say (whoever they are) that you should be able to face your food. I struggle with that as even raw meat gives me the chills. I truly believe what They say… when I was a meat eater I never cooked it because the raw meat just really gave me an uneasiness. But, for some reason I couldn’t really give up fish or crab meat (when opting for going veg) and I don’t believe I could ever have crabs like this again… it was a first and a last! Next Post Whaaaat I Ate Wednesday!